It is not a coincidence that Tom Herck created this piece of art at the age of 33, which was the age of Jesus being crucified. On the floor there is a giant tub (81 square metres) containing 5000 litres of water mixed with powder and milk. The cow itself is the cast of a dead specimen and weighs 200 kilos. Since Tom Herck finds it very hard to produce a cow without an anatomic model, it was a deliberate choice of the artist to take the corpse of a dead cow as a starting point. Moreover, no images can be found of a cow being crucified. 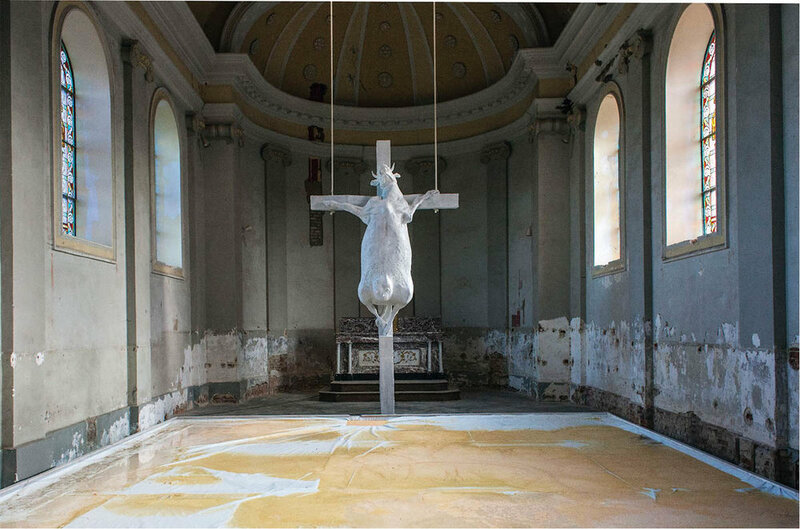 By hanging the cow on a 18 ft cross weighing 500 lb, we can notice the cow struggling. Its legs are adverse and its chest pointing forward, which reminded Tom of Christ’s holy heart. Creating the drama. The cow glances at the sky on its right. Christ too, was depicted like this, or looking down on Maria. Magdalena. Tom did some research by visiting a dairy and meat farm, to check out where his food is generated. 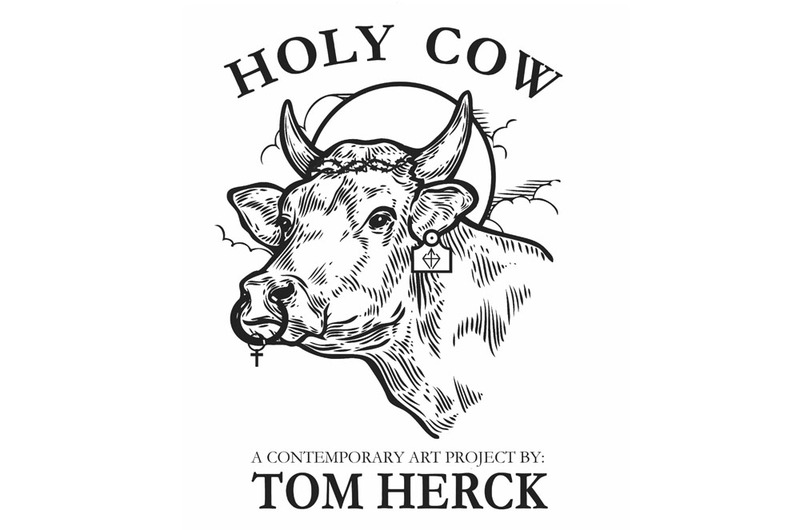 The logo of ‘Holy Cow’ shows Tom Herck’s critical vision of our current food supply chain. Images of dairy and meat product labels often show a cow as a cartoonlike animal, to make customers forget that it is a living creature. Tom’s logo however, shows a lifelike cow, thus setting the tone for his art project ‘Holy Cow’, which brings up the drawbacks of our current society without moralising. When the artist Tom Herck entered the church of Kuttekoven for the first time, he was overwhelmed and deeply touched by the old splendour of the Roman church. He wanted to evoke this feeling again for his audience, calling it the ‘Holy Cow-effect’. He was inspired by the decline of this beautiful church. When he saw some strong cows grazing in the meadow across the church, he started to make associations. In the region of Haspengouw, where Tom was born, a cow is an everyday sight. Both cows and churches are quite impressive appearances. Yet, very few people take their time to have a closer look at them. 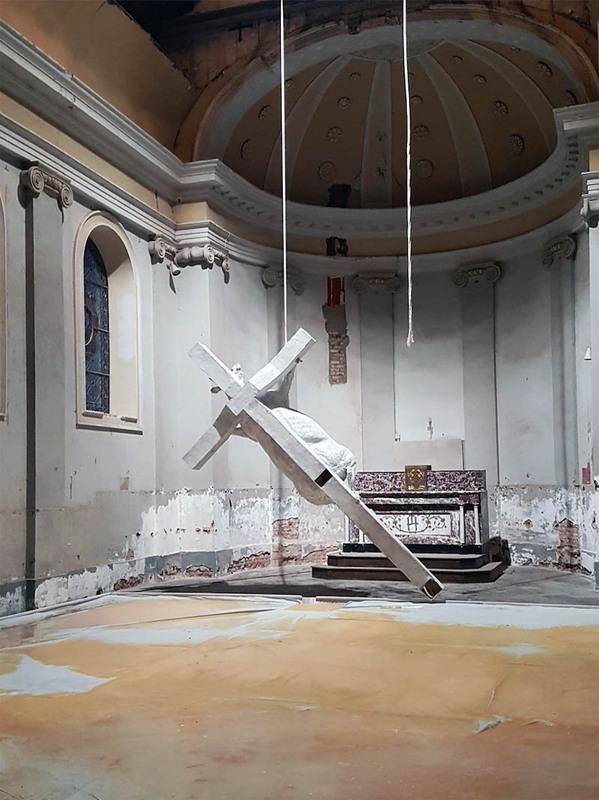 At first sight, the setting of the white piece of art in a deteriorated church might be out of place, but Herck thought about every single detail. In previous exhibition rooms Tom used to exude decline by means of the piece of art istelf. This time, his approach is reverse: the immaculately white colour of the cow and its milk strongly stand out from the church in decline. On the one hand, he wants to criticise the appaling waste in the meat and food industry. Hence the giant milk tub and the crucified cow. On the other hand, many empty churches like this one falling into abeyance are a waste of magnificent space to him. 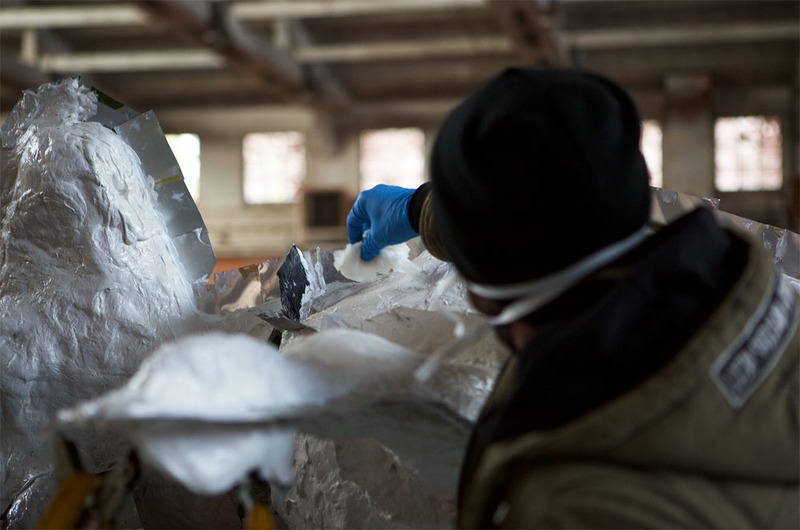 Combining these two types of waste creates a great and touching masterpiece. The ghost of ‘Holy Cow’ will live on in different bodies, even after the exhibition. Tom and the taxidermist had the number of the cow tattooed as a tribute. 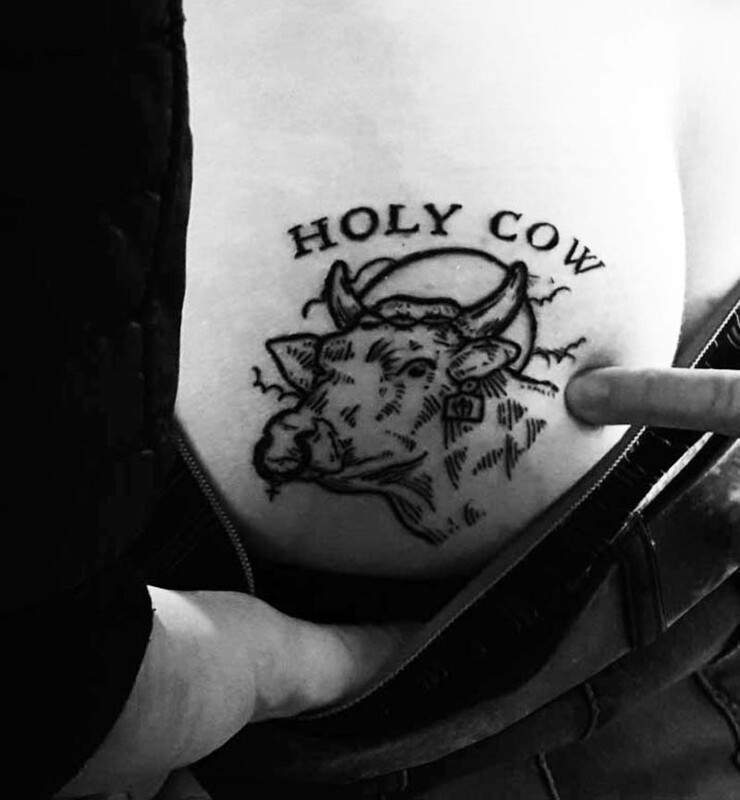 A friend of Tom’s had the Holy Cow logo tattooed on his behind; the same spot used to tattoo cows. The Holy Cow-expo went on for 5 weekends and attracted 1,800 visitors. The Holy cow effect worked: some visitors were so overwhelmed that they burst into tears. This may have to do with Tom’s gift to expand things. Along with decline and satire, expansion is the directive in his work. However, Holy Cow did not only generate admirers, but also opponents. The striking image of a cow on the cross was considered blasphemic. 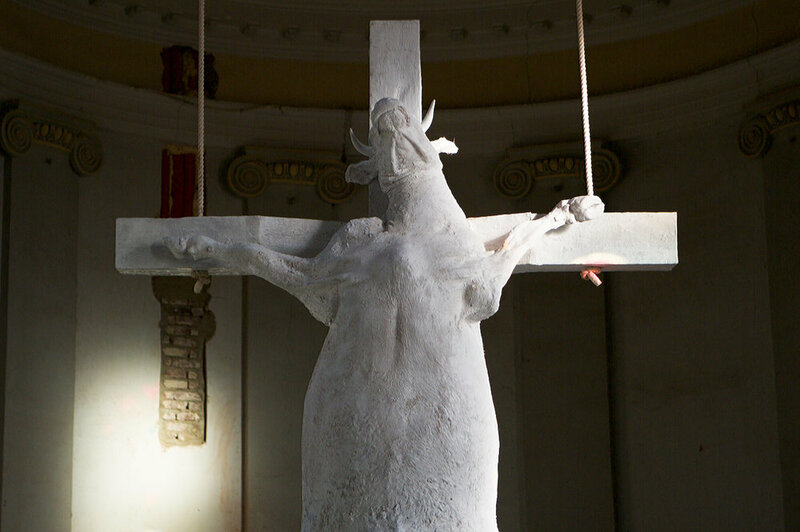 Moreover, many opponents objected to Herck’s piece of art being exhibited in a church that hadn’t been desecrated yet. Still, the church had been unused for 10 years. Herck received numerous hate mails and calls from all over Europe. Holy Cow became international news. Vandals made several attempts to damage the piece of art. The week after the opening the church’s lock was forced. One week later the lock was forced again during the night before the opening. Also a tainted glass was smashed. Vandals tried to take down the cow using a knife attached to a stick. They failed, as the cow got stuck in the rope. In the morning of the expo vandals made a third attempt of destruction, this time in the Gasthuiskapel, the location where another part of the expo took place. They poured petrol on the front door thus setting fire. If the fire brigade hadn’t arrived that fast, the fire would have escalated. Tom Herck had to close this part of the exhibition due to smoke damage. His artefacts were taken to fire experts. 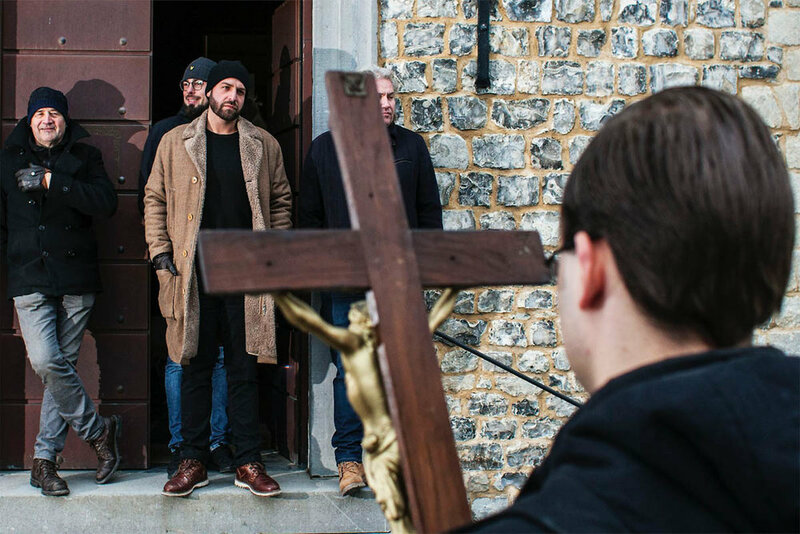 Later that weekend a group of catholics protested with flyers in front of the church in Kuttekoven because they thought the piece of art was blasphemy. While Herck was staying in Prague for business, the church was burgled again. In order to get inside the burglars smashed the tainted glass; they cut the ropes and took down the cow. The walls were sprayed with graffiti showing Latin texts and anti-Semitic slogans. Herck repainted the cow white, ready to be exhibited again.Four hours before the opening of the expo, another burglary through the tainted glass was detected. The vandals wouldn’t stop; they made a sixth attempt. This time they poured nitric acid over the cow. In the final night of the expo Herck and 5 of his friends stood guard at the church from midnight till 7 a.m. facing the bitter cold. He only slept for 4 hours and opened the expo again the next day. Despite all this fuss, the expo could be continued without a single minute delay. 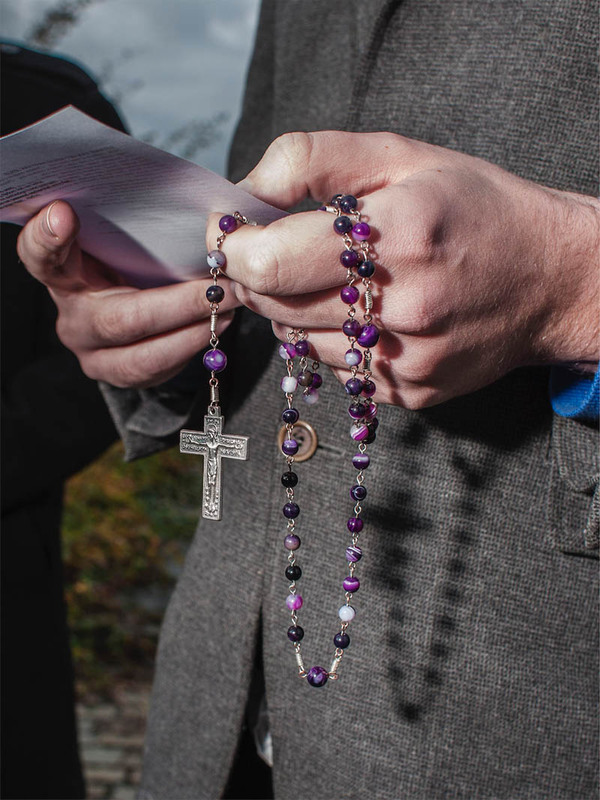 After the exhibition catholics held a purification ritual in the church of Kuttekoven. © Text by Mona Thijs. © Photos by Sebastien Steveniers, Erik Jamar, Raymond Lemmens.